Dandelion greens? We all know it's a weed - But that 'weed' makes a delicious (and extremely healthy) pesto. Because dandelion leaves are tougher than basil, use the food processor to make this version of pesto. A blender would work as well. This makes quite a bit and you can freeze whatever you don’t use, or cut the recipe in half. Put about one-third of the dandelion greens in the food processor or blender with the olive oil and chop for a minute, scraping down the sides. Add the remaining dandelion greens in two batches, until they’re all finely chopped up. Add the garlic cloves, pine nuts, salt, and Parmesan, and process until everything is a smooth puree. Taste, and add more salt if necessary. If it’s too thick, you can thin it with more olive oil or water. -Spread over pizza with cooked potatoes slices, then baked. -Smeared on crostini over a layer of fresh spreadable cheese. -Use to dress potato salad. 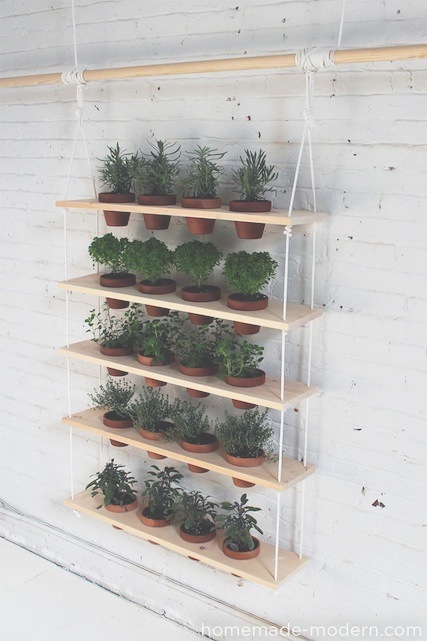 If you don't have space for a garden, or want to maximize your growing potential both indoors and out, this DIY solution is both practical and beautiful; a minimalist (and impressive) hanging garden. What's more; growing indoors using this method allows you to offer enough soil space per plant to grow a wide variety of fresh produce; anything from basil and strawberries, to cherry tomatoes and kale. Find the complete DIY guide here. Starting seeds indoors gives you a jump on the season and allows you to try more varieties than will be available locally. Good timing is critical for starting seeds indoors. To ensure you begin starting seeds at the proper time, determine the last frost date in your area (roughly). Choose containers based on your needs, preferences and quantities you are growing in. Use pots with drainage holes, also known as community pots, for starting a group of seedlings. 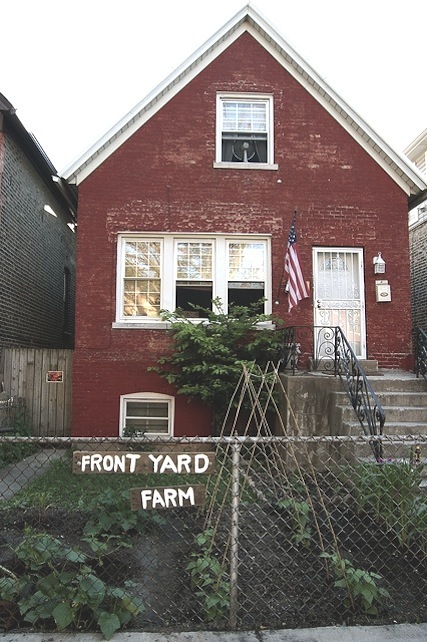 Next step: Soil. You can buy organic seed-starting mix at most garden stores, or make your own (using 4 parts screened compost, 1 part perlite, 1 part vermiculite 2 parts peat moss). Don't use potting soil, often it is too rich and doesn't drain well enough for seedlings. Fill your pots with the soil, leaving some space to the brim. Using your finger, a pencil - whatever - make 'seed holes' about twice as deep as the seed is wide, and at the depth and distance recommended on the seed packet. Cover with more mix unless otherwise specified. Seeds that require light to germinate can be sprinkled on the soil surface. If you're no good at identifying what you've planted, label your pots, or use little wooden indicators with the name of the plant in the soil. At this point, you can choose to cover your seeds with a cotton cloth to keep warmth in until the seeds germinate and begin to emerge. Now, you can remove the cover and watch them grow steadily. Keep the soil moist; never too wet. When the time is right - move the little guys outside. Enjoy your organic, local mini-mart. Summer's over - that doesn't mean you have to rush to use all of your gardens herbs before they spoil. Drying herbs is so simple and effective; if stored correctly it is the best way to preserve the fresh flavour for all your winter cooking. Harvest your herbs in the morning, before the heat of the day has warmed them. Rinse and dry them of any debris. 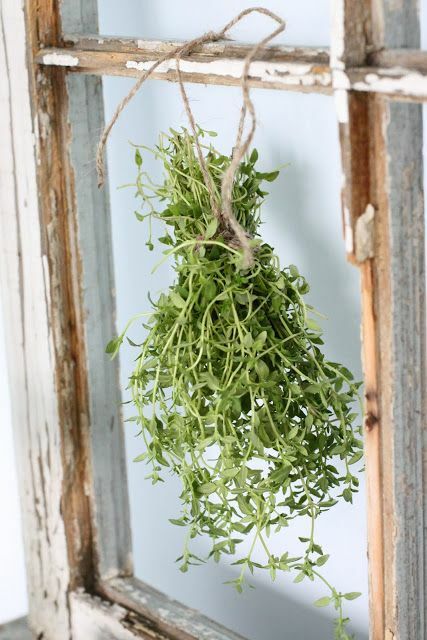 Group your herbs together, and tie the stems in small bundles and hang up-side down - a dry, dark area is ideal for drying, with an optimum temperature range of 26C-32C. Realistically, in fall we won't find these temperatures, so in cooler temperatures it may take up to a week or two to dry completely. Monitor the herbs daily. Once they are thoroughly dried, (crackly to the touch), separate the bundles and gently strip the leaves from the stems. Store your dried herbs in labeled airtight containers to best preserve their flavour. Even in today's modern, tech-savy day and age it is extremely important to be self-sufficient, especially regarding your food choices. The option to grow organic foods is sadly becoming evermore constricted, but knowledge of a few simple, and rather primitive techniques can allow you to successfully create a supply of organic heirloom seeds from whatever you choose to grow in a seasons time. Assuming we don't all live on acreage's, trading seeds between other growing friends and neighbours can also be a more effective way to put together the 'ultimate food garden'. If you have been planting this summer, fall is a perfect time to begin harvesting seeds. If you haven't yet started a garden, you can still collect seeds by purchasing a variant of each vegetable (or fruit) you wish to grow from your local organic market. Peas are a great starter legume; Allow the pods, whether garden grown or store-bought, to dry until brown. If they are being grown in your garden, allow the pods to dry on the plant before harvesting. Store the dried beans in a cool, dry place until planting season. Tomatoes are also easy to start with. When ripened cut the tomato into halves, opening the vertical cavities that contain the seeds. Gently squeeze out the jelly-like substance that contains the seeds. If done carefully, the tomato itself can still be eaten or saved for canning, sun-drying or dehydrating. Peppers are similar to tomatoes, when fully ripened it is easy to collect seeds from; simply cut in half and place the clean seeds on a paper towel. Let dry in cool location until seed is dry enough to break when folded. Regardless what you are growing, communicate with others and trade seeds to widen your collection. Keep all your seeds dry and in a cool place to be ready for planting next spring. Lettuce is a great staple vegetable to have in your garden, and a relatively easy vegetable to teach you the principles of seed harvesting. Let a few lettuce plants intentionally go to seed (flower). The flowers will go through a few stages before being ready; they will bloom first - waiting for pollination. Once pollinated the flowers will close up. When they re-open, they will re-open with a white fibre that helps the seeds float to propagate. When you see the white fibres, gently pull it out of the casing. You will have several small lettuce seeds ready to be dried for spring. It's hard to believe that even inside our homes unwanted gases and fumes are almost always present and can cause unwanted negative health effects. Studies have shown that on average presence of toluene, xylene, ethyl acetate, methylene, acetone, benzene, trichloroethylene and formaldehyde is quite common - some of these components carry serious risks and can lead to problems such as chronic asthma, cancer or severe allergies. Studies done recently by NASA and the Associated Landscape Contractors of America (ALCA) have concluded that growing plants within the home drastically reduce these chemicals, giving you naturally purified air and balanced indoor humidity. Some of the plants best renown for improving air quality include: Spider Plant - fast growing, decorative and effective at removing air toxins, Boston Fern, Areca Palm - grows slowly but acts as a humidifier, Snake Plant - renown for amazing abilities to remove formaldehyde and nitrogen oxides and Marginata (Dracaena marginata) - which is known for its stunning red colours and capabilities to filter most toxins from the air. Seen above are the Wally Wall Home Planters by WollyPocket: Made in the USA from 100% recycled plastics. Find them here.